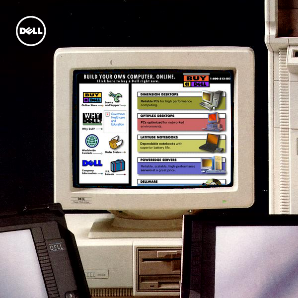 It was clear we made the right choice as just six months later, Dell.com reached $1 Million in sales a day and nearly 20 years later, revenue of Dell.com has reached approximately $15 Billion per year, making us one of the largest online retailers by Web sales on the planet. Though times may have changed, our mission and commitment to you remains the same – to make Dell the easiest technology company on the planet to do business with. We organized the website around the way you shop ('For Home' and 'For Work') instead of how we organize our business, making the website easier to navigate and the content that is important to you easier to find. You’ve asked for a simple and easy support experience regardless of where you are or what device you are on, so we launched a streamlined support experience that is mobile friendly. We redesigned the “For Home” experience, improving your ability to find the products and services you are looking for through improved search, product compare and by reducing the number of steps to complete a purchase. This improved experience is also available on mobile devices and tablets in the US today and will be available globally by the end of the year. We also accept new forms of payment online. Earlier this year we announced we started accepting Bitcoin in Canada and the UK, in addition to the US – making Dell the largest merchant to accept bitcoin internationally. Our Social Media Command Center has enabled us to respond to you more quickly. In fact we have a 99 percent Customer Satisfaction Resolution Rate – so we’re not only responding to you quickly, we’re getting you the answers you need. With smarter tools, we’ve been able to nearly double our reach. A concerted investment and dedication to a more agile innovation cycle allows us to bring these improvements to you more quickly. And, you’re taking notice! We’ve seen a 26 percent increase in Customer Satisfaction year-over-year. During arguably one of our busiest buying periods of the year, Black Friday/Cyber Monday Dell.com had one of the top 10 mobile response times. This kind of success translated whether you were reaching us through your desktop or mobile. 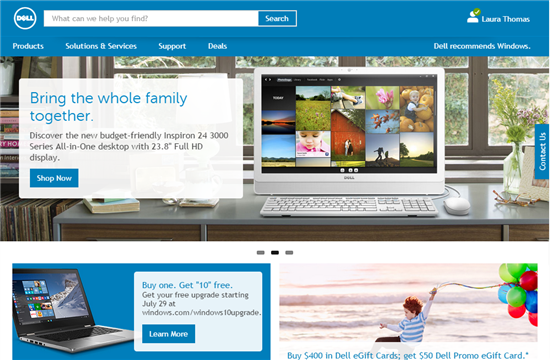 We continue to find ways to make Dell.com faster, easier and responsive to you and your needs. I promise we will continue to keep this same focus on serving you over the next twenty years. Dell.com will continue to put you, our customers first, evolving based on your feedback. What additional improvements would you like to see to Dell.com? I have a recommendation for Dell on how to sell lots of PCs to home users. There are many people, especially older folks, that are using old PCs, because they don't want to go through the hassle of reinstalling all their software, loosing their customizations, and learning new operating systems. Dell could develop a system whereby the customer could, either at home or through mail in / onsite service, transfer everything from a user's old PC to a new one. This way they would be using the same Windows OS, just on shiny new Dell hardware with fast SSD and up to date warranty and support. Probably this wouldn't work on Windows XP, but should be feasible with Windows Vista or Windows 7. Maybe consider upgrading people's PC to Windows 10, whilst keeping all their programs and settings. Phil 5, it's not that simple. I was trying to upgrade my home PC Windows 7 to 8.1 and even that migration was not going to be smooth. Windows 8.1 introduced a new type of applications that are forward compatible only. My data could go forward, but almost all of my applications would not be moved forward. I'm in my 30's and tech savvy. This schlep as you have described is almost unavoidable. Robbie_Smith, re-read what Phil suggested; he's asking Dell to make a total transfer service, *including* the OS. You're right on the Windows 10 part though. Even Win 8 → 8.1 broke stuff for me and others. That's right pydsigner. Transfer everything including OS. So someone running Windows 7, will have the same Windows 7 with license on the new PC. My dad with his small business is a good example. Running an old laptop that regularly breaks down. But he's paying big money to fix it instead of getting a new one just so that he doesn't have to reinstall a new one.